Finally, after a long winter, summer is here. Nothing announces summer like fun, colorful summer cocktails. Whether it’s a cocktail hour for two, a pool party or a special occasion, no summer celebration is complete without a few colorful cocktail recipes. Muddler. A muddler is used to crush fruit, herbs, spices and more to extract flavors. Reamer. Like a muddler, the reamer produces fresh juice from your favorite fruits. Channel Knife. To create twists and garnishes, you will need a channel knife. Jigger. A jigger measures the perfect one ounce or half an ounce for your cocktails. Zester. A zester allows you to capture the aroma and tang of citrus. Knife. A small four-inch blade is used to dice and slice ingredients. Stirrer. A long stirrer blends your cocktails thoroughly. Strainer. You’ll use a strainer to separate the ice from liquid while pouring. Corkscrew. Make sure you have a corkscrew if you need to open wine. Bottle Opener. Use a bottle opener to pop the top off mixers or beer. Seabreeze. The Seabreeze is a summer trademark. Combine two ounces of vodka, three ounces of grapefruit juice and three ounces of cranberry juice. Garnish with a lime wedge. Pour over crushed ice, and you have a drink as brisk as a day at sea. Blue Margarita. This smooth cooler is a twist on the basic margarita. Shake one ounce of silver tequila, one ounce of blue curacao and an ounce of fresh squeezed lime. Strain into a salt-rimmed glass and garnish with a lime wedge. Berries Lemonade. This adult version of lemonade is tasty and colorful. Mix a one-ounce jigger of water to the reamed juice of a fresh lemon. Add two teaspoons of sugar, four fresh raspberries and four fresh blueberries. Finish with a splash of ginger ale or club soda and a one-ounce jigger of vodka. Enjoy. Bellini. The is the perfect summer brunch drink. Ream juice from a fresh peach into a chilled glass and fill with champagne. Garnish with a peach slice floating on top. Grasshopper. Cool and refreshing, this green drink is a summer classic. Mix one ounce each of green crème de menthe, white crème de menthe and light cream. Shake and strain into a cocktail glass. Mimosa. A weekend traditional that’s good anytime is best served with three ounces of fresh squeezed orange juice and three ounces of chilled champagne. The Blood Orange Snowbird. Mix two ounces of vodka, fresh-squeezed blood orange juice, Italian blood orange soda and a squeeze of lemon. This drink is as colorful as it is cooling. Mango Daiquiri. Straight from the sunny islands, the mango daiquiri is a great poolside sipper. In a blender with crushed ice, combine one ounce each of light rum and lime juice to one teaspoon of sugar, two ounces of pureed mango and a tablespoon of Triple Sec. Whatever your drink of choice may be, get out there and enjoy summer. 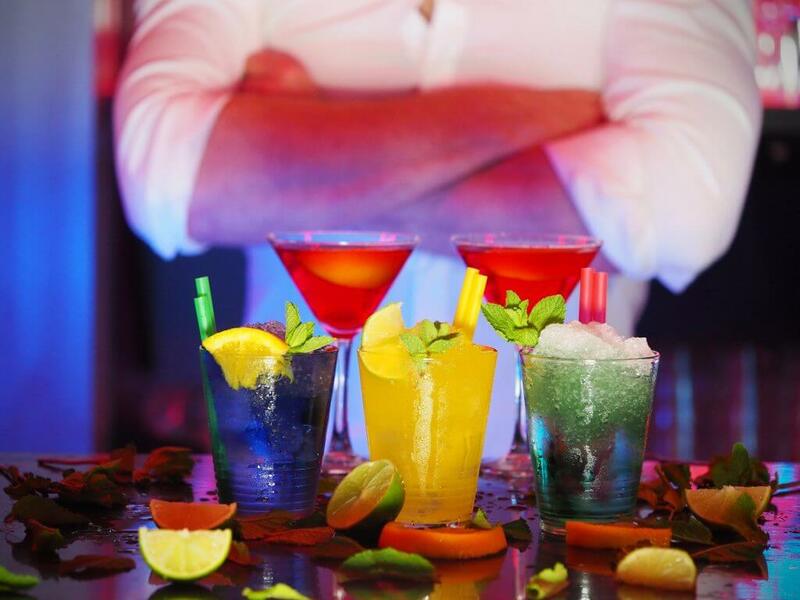 Experiment with different fruits, mixers and liquors to make your summer signature drink. Cheers!